People are talking about The Dark Knight to catch up with Titanic, which grossed over $600Million in its box office. 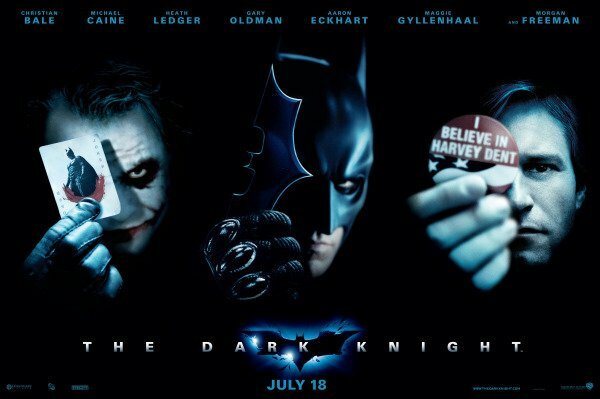 The Dark Knight has brought in $470Million on its 13th day out. I’m hesitant to dive into a detailed analysis of why I like the movie so much. I want to see it again and i want to keep this pleasant enjoyment intact, like a ball of well designed flower arrangement. Taking it apart is to destroy its beauty. I like the movie, all of it. The way it is made, the shots, the lighting, the subtleties of the acting, not just from Heath, but also Christian Bale, Aaron Eckhart, Michael Caine, and Maggie Gyllenhaal. I like the stage design, how stark the “bat cave” looked in its industrial lofty brickwalls and tall rough glass panes. Even the minor thug characters are just right, they are fleshy real, adding in their own texture. And of course, the brilliant lines delivered by Heath tied all the pieces together. Now i can’t remember whether i have seen The Batman Begins. Vaguely i seemed to remember i have and liked it. but I can’t be sure it is not just the trailers that i remembered. because how could i never write about it if i had? puzzling. This is hilarious:Stuff White People Like: #106 Facebook. For a brief period of time, MySpace was the site where everyone kept their profile and managed their friendships. But soon, the service began to attract fake profiles, the wrong kind of white people, and struggling musicians. In real world terms, these three developments would be equivalent to a check cashing store, a TGIFridays, and a housing project. All which strike fear in the hearts of white people. White people were nervous but had nowhere else to go. Then Facebook came along and offered advanced privacy settings, closed networks, and a clean interface. In respective real world terms, these features are analogous to an apartment or house with a security system/doorman, an alumni dinner, and a homeowners association that protects the aesthetics of the neighborhood. In spite of these advances, some white people still clung to their old MySpace accounts. That was until they learned that Facebook started, like so many things beloved by white people, at Harvard. Within a matter of months, MySpace had gone from a virtual utopia to Digital Detroit, where only minorities and indie bands remain. So where does “insight” come from? How does the “aha” moment come into being? Is it really a surprise? Turned out, not really. Our brain knows more than we do! and it works hard to get that “aha” moment into light. An interesting article in last week’s New Yorker: The Eureka Hunt, by Jonah Lehrer. It is only an abstract on-line. You have to get a paper copy to read the whole thing. Back when Tibet controversial was in full swing, there was a very propaganda-ish video defending the pro-China position. The New Yorker just came out with a pretty good profile on the author who actually made that video. Angry Youth, The new generation’s neocon nationalists., by Evan Osonos. It is quite interesting to learn that the author is a Ph. D. student in FuDan University (one of the top universities in China), major in Western Philosophy! Go read it, you won’t be disappointed if you took a tiny interest in the entire Tibet vs. China debate in the Spring. So Danish Newspaper’s cartoon caused outrage in Muslim community back in 2005. 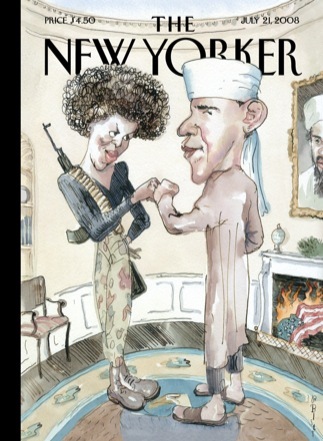 Today’s issue cover of The New Yorker caused another controversy, and somehow Muslim related, too. Personally i think it is just another over-reaction, similar to the first cartoon controversy, maybe milder. But in principle it is the same thing. Since when American politicians are behaving like Chinese ones? So sensitive? and so thin-skinned? In reality, aside from the lighthearted Sempe’s, most of The New Yorker cover art has always puzzled me. Always thought of that as The New Yorker style. Their satire has always been highbrow and seemed to be understood by a tiny group of people within their own club. They liked to pick some obscure but i’m sure highly amusing facts once you understood the context. I doubt they did anything different this time. Their only mistake is to pick on some facts that people could actually understand, or maybe just think they understand. If the US is going to behave more and more like the China, i wonder if the Chinese will behave more and more like the Americans? Looks like they are trying, at least they have displaced Americans and became the most obnoxious tourists. San Francisco is preparing to undertake the nation’s most ambitious trial of a wireless sensor network that will announce which parking spaces are free at any moment. Drivers will be alerted to empty parking places either by displays on street signs, or by looking at maps on screens of their smartphones. They may even be able to pay for parking by cellphone, and add to the parking meter from their phones without returning to the car. This reads like a novel, specifically, this reads like Ian McEwan’s Atonement, the Chinese version. It means, you have to read to the very end. From: EastSouthWestNorth: The Weng’an Mass Incident.